For the next few days I will be participating in a Design Thinking for Educators workshop at the Henry Ford Learning Institute in Detroit. Today started with an introduction to the process and with a rapid cycle challenge. First let me talk about the process. The image with this post comes from the Henry Ford Learning Institute website (link above) and goes through the process starting with empathy. It's important to start with this because it allows you to put aside your own wants and needs that will bring you to what could be the ideal solution for you, but not necessarily for the wants and needs of another person. Walking in someone else's shoes is important so that you design a solution for them. This stage is the intellectual identification of the feelings, thoughts and attitudes of others - it deals with you listening to both their explicit needs and trying to hear the implicit ones too. The next step in the process is to define or reframe the problem and to make sure you are clear about who the person is who needs the solution. You need to listen in a focused way so that you can choose your goals. Whereas empathy allows for a lot of diverse opinions, define narrows the focus and form a clear picture from what could be a lot of chaotic data. At this point you may end up throwing ideas out. Defining the problem involves making a problem statement, also called a User-Needs-Insight statement. The third step of the process involves ideating - brainstorming the many different options available and writing down all ideas no matter how crazy they might seem. It still includes listening to the ideas of others and possibly deciding on the best combination of ideas. It's important to bring together a lot of ideas and diverse perspectives. Prototyping comes next - often this might involve making a model, trying out an idea or bring an idea to reality. This allows you to see in a practical way what does and doesn't work. It's a place where you have have failure with low risks, and will allow you to move forward. The last 3 parts of the process have mostly been about your own ideas, but feedback brings us back to the "client" again and this feedback will allow you to know what will or won't work for him or her. You can then change or refine the design to make it better and more personal. At this stage it is important to allow honest feedback. Reflection is the final stage of the process. Looking back allows you to move forward as you will only improve if you can reflect on what didn't work - knowing this allows you to work out how to overcome any new challenges. 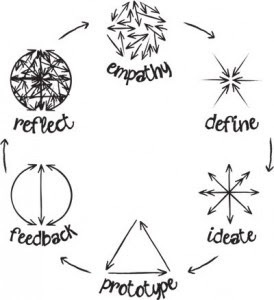 This is a fascinating workshop and I will be writing many more posts about what we have been doing at the HFLI this week as my knowledge about design thinking deepens. Working in the rail industry in Melbourne for 3 years, we had a few workshops on this type of thinking but it I cant recall what it was called exactly but its the same idea. Im reading alot of Tom Barrett's stuff, and making SO many connections between what I learned in the rail industry to education. Thats weird Id never though the 2 would connect! But thats where it all began right? I was in a group of problem based engineers and we met with the solution based engineers in weekly meetings (or more) addressing rail issued ranging from signalling and overhead issues to track, and station/pedestrian issues. A think tank I guess. Im only now really making those connections with my teaching. Id never thought Id connect this to my teaching. Hi Jay, thanks for taking the time to comment on this post. 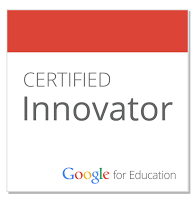 Tom is excellent - I met him at the first Google Teacher Academy in London in 2010. Both of us have moved so far since then - him to Australia and me to India! Interestingly enough my husband was also a railway engineer in Holland. I think it's great that you can connect the idea of design thinking with your teaching in order to give your students the best possible experience that they can have!